ADVICE is an app in Utopia that gives algorithmic considerations of multiple bacterial strains in conjunction with the client’s own genome to provide true/false clinical outcomes. ADVICE automatically pulls the client’s Opus23 genetic data where relevant, and incorporates it into algorithmic calculations. (comparable to LUMEN in Opus23). From the Utopia drop down menu, hover over ‘Algorithms’ until a second list appears, then select ‘Advice’. You are presented with a list of algorithms, those that are true are at the top and display the word ‘TRUE’ in a green box, followed by those that are false, which display the word ‘FALSE’ in an orange box. Each algorithm will display the repute (risk, benefit or neutral), and the magnitude. If an algorithm suggests prescriptive metabolites which enhance or reduce specific bacteria, they will be listed under Encourage or Discourage. The client’s relevant genes will be displayed beneath the listed ‘microbiota’ information in the same format found in the Opus23 LUMEN app. Clicking on the colored semicircle will open a pop-up window with a description of the gene and giving details of the client’s SNPs for the gene from their Opus23 data. 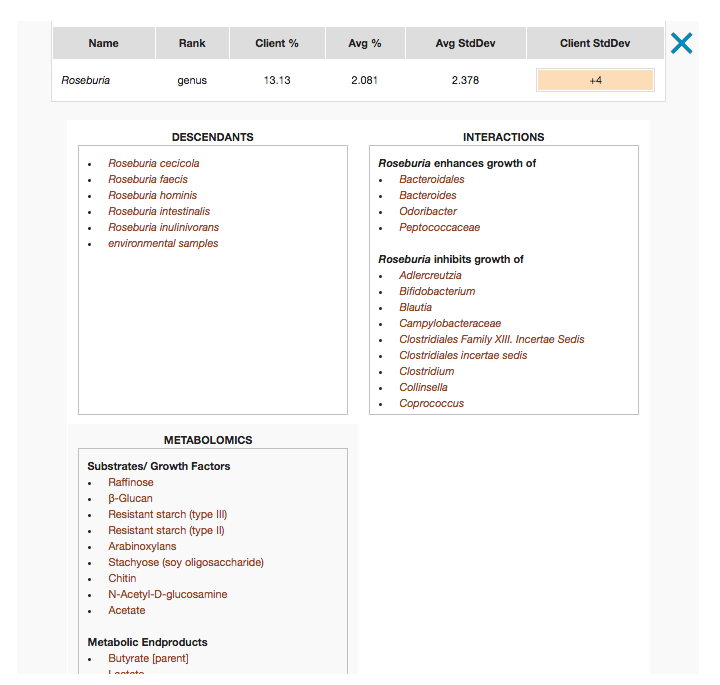 All metabolites and taxa are clickable. Clicking a metabolite opens a pop-up window with a list of bacteria affected by it. Clicking a bacterium opens a pop-up window as described in previous apps. To add an algorithm to the client report, click on the ‘Add/ Uncurated’ button. 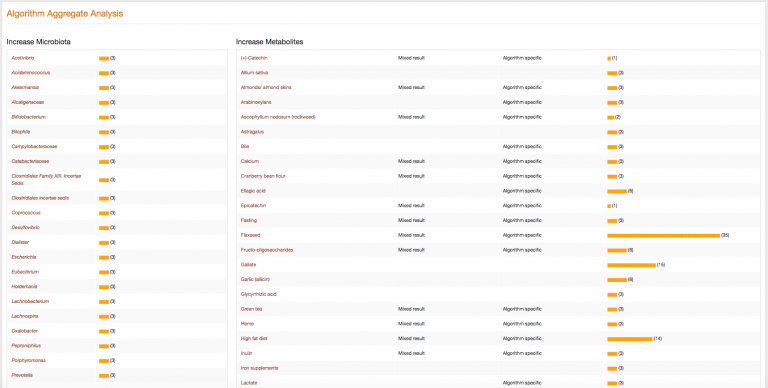 Individual genera may also be curated and added to the client report for the current dataset by selecting the taxon to open its pop-up information and then clicking the ‘Add/Uncurated’ button. At the bottom of the page is the Algorithm Aggregate Analysis. This is a summary of all advice for the client listed under either an ‘increase’ and ‘decrease’ section heading. Each section provides both the microbiota and beneficial/ harmful metabolites that are suggested to be increased or decreased by your client. The ‘result’ information can be a useful tool for streamlining complex treatment strategies. Each metabolite listed in the Algorithm Aggregate Analysis details whether or not the metabolite has mixed results (included as both encourage and discourage in ADVICE algorithms), and whether it is specific to an algorithm.